MUCH TO THE DELIGHT of scientists and technicians, the frigid sky over the snow-covered Siberian fields and villages remained clear as dawn approached. The February stars put on a dazzling show as they revolved about Polaris, higher in the sky than many of the foreign visitors were used to seeing it. The frequency of sporadic meteors increased as the night grew long, as if providing a warm-up act. Charter flights were already in the air, filled with business tycoons and celebrities, and rumor even had it that Russian President Vladimir Putin was on one. The planes could be seen in all directions except in the special airspace dedicated to cooperative research flights by the Russian Federal Space Agency, the European Space Agency, and NASA, and in the restricted airspace directly beneath the asteroid's projected path. In order to keep light pollution from interfering with the observations, the nearby city of Chelyabinsk was in blackout. Everyone waited at the ready for the meteor event of the century. This is a fictional account of what might have happened February 15, 2013, if we had been a decade further along in our efforts toward asteroid discovery and planetary defense. An array of powerful space-based infrared survey telescopes (such as the proposed NEOCam or Sentinel Mission), combined with dedicated ground-based telescopes (such as ATLAS and LSST, both currently under construction) might have been able to warn us of the 65-foot-wide (20 meters) asteroid that exploded over Russia, causing damage and alarm. We have pieced together the asteroid's story from recovered fragments and serendipitous dashboard-camera footage. But imagine instead how the events near Chelyabinsk might have unfolded if an advanced detection system had already been in place. In that fictional world, by the time the southeastern sky began to glow with faint hints of light, scientists had been up all night calibrating and testing their equipment. The weeks of planning meant they had time to spare, and they spent it photographing the stars, drinking coffee or tea, fidgeting, and (except for the North Americans) smoking cigarettes. High-definition cameras, telescopes, radiometers, radar dishes, spectrometers, and optical pyrometers all pointed at a spot above the eastern horizon. The instruments were mounted on gimbals so they could rapidly slew at just the right rate to track the fireball. Even with advanced warnings, there would be no second chance. Researchers already had deployed arrays of seismometers, geophones, microphones, infrasound detectors, microbarographs, anemometers, and dust collectors. Now, just before sunrise, they launched drones and balloons to get precise readings of atmospheric conditions and to record the characteristics of the blast wave in three dimensions. It wasn't just the scientists who were recording. Production company film crews were on the scene, including multiple IMAX cameras on the ground and in the air. This would be the best-documented natural event in history because it was the best ever predicted. Since its discovery a month earlier by two new space-based infrared telescopes, designed and launched for just this purpose, the asteroid had swept close enough to be observed by ground-based optical telescopes. In the last few days, radio telescopes at Goldstone and Arecibo were able to join the effort, and last night even amateurs made sightings. Its reflectance spectrum suggested that it was an ordinary chondrite, rocky and unevolved. Radio telescopes estimated that it was between 17 and 20 meters in diameter. There was still a lot of uncertainty about its mass because no one knew whether the asteroid was a single rock or a porous rubble pile. But it couldn't be much more than 12,000 tons even if it were fully dense. Meticulous observations had characterized the asteroid's orbit so precisely that scientists were predicting the time of impact to the nearest second, the location to the nearest kilometer, and the entry speed to be exactly 12 miles (19 kilometers) per second. It would almost certainly explode in the atmosphere, and simple physics determined the energy of the explosion: about a half megaton of TNT. Despite being 30 times bigger than the explosion that destroyed Hiroshima, that estimate had come as a great relief to the residents of Chelyabinsk. A month earlier, a much bigger explosion had not been ruled out, and there had been contingency plans to evacuate the city's million residents. A half-megaton explosion high in the sky can be powerful enough to blow out windows and do damage, but officials determined "shelter in place" and the Cold War "duck and cover" drill sufficient to protect city residents 25 miles (40km) to the north. On the other hand, more local villages were still at risk from falling meteorites, which could be fatal, and residents were advised to leave the area. About 15 minutes before sunrise, powerful radar started receiving reflections from over the horizon while the asteroid was still thousands of kilometers above the Pacific Ocean. Twelve minutes later, it had traversed China and Kazakhstan. 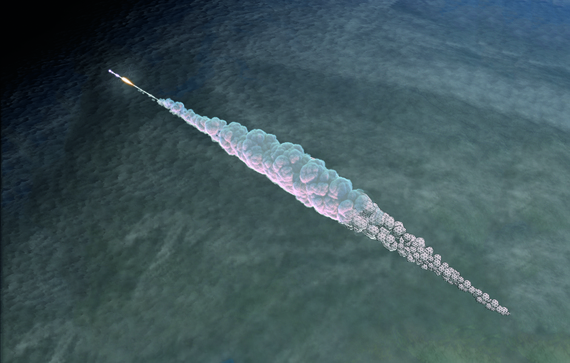 A few minutes after that, the Russians fired an array of smoke tracer sounding rockets, like fireworks, into the sky along both sides of the asteroid's trajectory, to measure the shock wave like in the good old days of Cold War atmospheric nuclear testing. As the asteroid approached the border into Russia, still more than a hundred kilometers up, sensitive infrared detectors and radiometers locked onto it. Read the full article "In Search of Death Plunge Asteroids" in the July 2015 issue of Astronomy Magazine.